An open-source space sim and a spiritual successor to the Escape Velocity series featuring exploration, trading, and combat. The game is under active development and a lot more content is planned. It’s in a very playable state already, but certain aspects lack polish and it’s a good idea to consult the manual before playing for too long. A thousand years in the future, humanity has colonized over a hundred star systems. You grew up on a backwater planet and after years of hard work you’ve saved up enough to get your very own ship and strike out to seek your fortune. Make money any of a myriad of ways - ferrying passengers or cargo, running trade routes, mining asteroids, escorting freighter convoys, fighting pirates and selling their ships for parts, being a pirate yourself, and so on. Buy (or capture) better or more ships and build up your fleet to be able to take on bigger and better jobs. Explore the galaxy, meet aliens, and get swept up in story arcs. There’s no voice acting and it’s not a very graphically-intensive game. Most story is conveyed through text, and many game systems (including trading, taking and completing jobs, upgrading and customizing your ships, and managing your fleet) are handled through menus. Spaceflight and combat are more active, taking place in a 2D star field with a top-down view. Ships have Asteroids -like controls, so to accelerate in a direction you have to rotate into it first, although there are some autopilot options to assist with common maneuvers like landing on planets or boarding targeted ships. Combat can get pretty hectic, especially as fleets (including your own) can become quite large and fleet management tools are limited, making it all the more jarring of a change from the sedate pace of the rest of the game. I understand that Endless Sky is following Escape Velocity ’s footsteps here, but turn-based combat might have been a more natural fit. The game gives you a lot of freedom to approach it however you like. I found it satisfying and relaxing to play as a merchant, taking odd jobs running cargo and passengers and hitting up trading posts to perform arbitrage along the way. Unfortunately, right now there’s only one major storyline, and while it starts fairly strong it railroads you into joining a particular faction and engaging in a particular combat-heavy style of play. Hopefully more alternatives will be added over time so that it’s not a choice between playing your preferred way and engaging with the story. Additionally, since the story missions present unique scenarios (which is good) they sometimes require interacting with less-polished game systems - so be ready to look for advice online if you run into issues. Worst-case, the save files are easily editable. 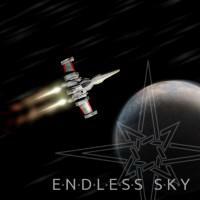 Endless Sky is a nostalgic and mostly-relaxing take on space sim gameplay. Hopefully it’ll continue to become more polished and offer more variety in story content over time, and some improvements to fleet management would help too. It’s still plenty worth a look in the meantime. I Stopped Playing When: After about twenty enjoyable hours playing as more or less Malcolm Reynolds, I started progressing the main story missions and ran into several frustrations that I felt forced me to change my fleet composition and play style in ways I didn’t want to, emphasizing maneuverability and combat instead of the long-haul space trucking I’d been optimizing for. This reduced my enjoyment a great deal, but the final straw was a mission that put me in an unavoidable large-scale fleet battle that wrecked my current ships, in a star system without a shipyard where I could buy different ones.